It is common knowledge that everyone needs to get enough sleep, and that the recommended hours of sleep are anywhere from seven to nine hours a night. However, the vast majority of adults don’t get this basic requirement due to their busy schedules and work shifts. Why do we sleep? For years, it has been a mystery as to why we need to sleep at all. The most popular and well-supported hypothesis of sleep’s purpose is that it cleans out and sharpens the connections in our brain. When we stay up too late, the efficiency with which our neurons signal to each other slows and this translates into impaired memory, attention, thought processes and decision making. Toxins, like the ones implicated in Alzheimer’s, are also removed from the brain while we sleep. Impaired neuron functioning is only the beginning of what sleep deprivation can do; sleep deprivation can impact disrupt hormones and neurotransmitters affecting mood. Being tired and getting less than the recommended amount of sleep can impair your driving skills as much as being drunk. On the other hand, it turns out that too much sleep can result in the same problems as too little sleep, including increasing risk for stroke, cardiovascular diseases, high blood pressure, diabetes, and various mental illnesses like depression. Therefore, the amount of sleep that is recommended is between 7-9 hours. Sleep has been implicated in a number of mental health disorders like ADHD, anxiety, and depression. Those who sleep poorly or don’t feel as rested by sleep might be experiencing more NREM, non-rem sleep, which is a lighter sleep and less restorative than REM sleep. REM sleep occurs on average after 90 minutes of sleep and throughout several hours of sleep your brain rotates through NREM and REM; you need about 4 or 5 of these sleep cycles to be fully rested. When it comes to mental illness, impaired sleep is often seen as a symptom. However, it might not be that simple. In some cases, sleep problems and deprivation might precede the development of mental health issues and put you at higher risk. This comes as no surprise seeing as sleep deprivation can change the levels of neurotransmitters which are often associated with the development of certain mental health disorders. If you already have a mental health disorder, sleep problems can make them worse. Some common tips and tricks that work to help improve sleep are to establish a pattern and night time routine. 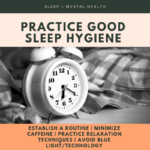 Having good sleep hygiene, like going to sleep and waking up at the same time everyday or keeping the bedroom clear of technology is imperative, so that you can sleep easier, deeper, and better. Minimizing caffeine, alcohol, and nicotine consumption can also help you sleep better or easier, or at least not having them a few hours before going to bed. For caffeine consumption, it is recommended that you stop drinking coffee 4-6 hours before bed. Although, alcohol is a depressant that might make you fall asleep faster, it also makes you wake up more frequently and have less restorative REM sleep, impairing sleep quality. Relaxation techniques like yoga, meditation, and deep breathing are also recommended to facilitate easier sleeping. If you or someone you know is struggling with a mental health disorder or sleep issues, please feel free to contact the professional team at Lifeline Connections for help. Getting yourself help, whether it is through self-help or by reaching out to professionals is an important part of recognizing that you are struggling and is a good step forward to get the help that you need. You can visit Lifelineconnections.org or call 360.397.8246 for more information.